After a string of incidents at the World Cup, football’s governing body prepare to take decisive action. 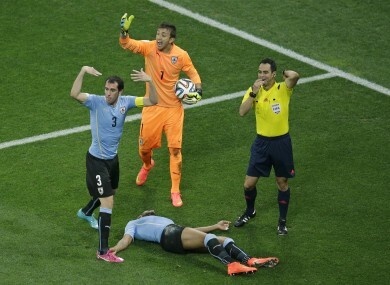 Uruguay's Alvero Pereira was knocked unconscious during a World Cup game against England but was allowed to play on. He later claimed the incident was like 'the lights had gone out'. FIFA HAS ANNOUNCED plans to allow referees to halt matches for three minutes so that players suspected of sustaining concussion can be assessed. The issue of concussion in football has made recent headlines following high-profile cases at the World Cup in Brazil, notably an incident that involved Germany’s Christoph Kramer during the final. “The incidents at the World Cup have shown that the role of team doctors needs to be reinforced in order to ensure the correct management of potential cases of concussion in the heat of the competition,” FIFA said in a statement. The medical committee also reported that the World Cup in Brazil had been a “clear success from a medical perspective, with a decrease in injuries and no positive doping cases reported”. “The number of injuries went down from 2.7 per match at the 2002 World Cup to 1.7 per match at Brazil 2014,” it said. Email “FIFA set to introduce three-minute concussion breaks”. Feedback on “FIFA set to introduce three-minute concussion breaks”.